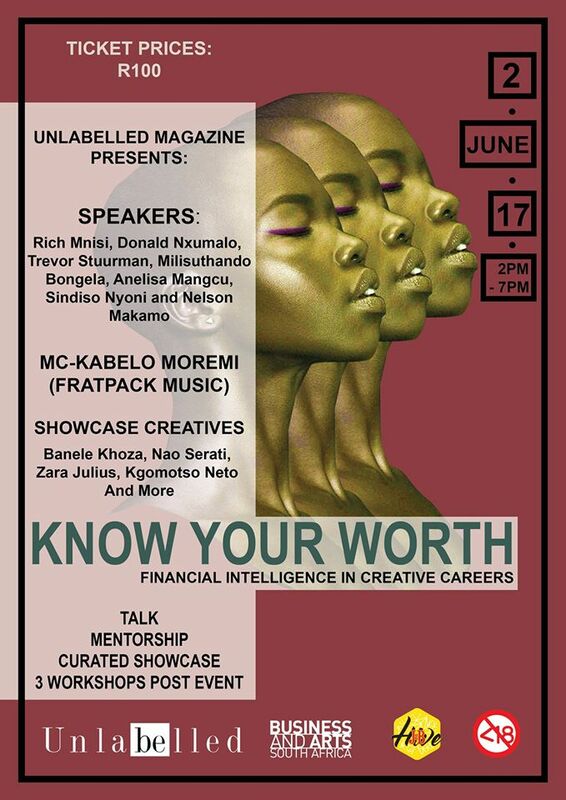 On the 1st and 2nd of June 2017, Unlabelled Magazine presents to you the “Know Your Worth” event. This exciting three part event will take place over two days and will consist of a talk, mentorship and a curated showcase at the J&B Hive in Braamfontein. The event theme is centred on addressing the topic of financial intellect in creative careers. And will touch on matters such as understanding your creative value in the market; how to be financially sustainable and stable; how to establish your worth; the role that one’s background plays in how one deals with money as well as knowing how to work with brands and clients, among many other related topics. Each day will consist of a talk and a mentorship session which will focus on a particular theme. Within the first segment of each day a conversation which will be steered by a facilitator, will held by panel members who have been carefully handpicked and are viewed as pioneers within their respective creative industries. Guests can expect to learn from fashion designer Rich Mnisi, interior designer Donald Nxumalo and photographer Trevor Stuurman on Day 1. As well as curator and concept Anelisa Mangcu, writer/director Milisuthando Bongela, illustrator Sindiso Nyoni and visual artist Nelson Makamo on Day 2. The end of the first segment will then lead us into the second part of the event which focuses around mentorship. For this part of the event we have partnered with Business and Arts South Africa (BASA), who will not only introduce an expert on financial planning but will also assist us in ensuring that the talk has a lasting impact as after the event we will host 3 workshops. Umuzi, the photography institution will also have representatives involved in the mentorship, talking about the opportunities available to creatives in the market. An ongoing showcase will also be held at the talk and will consist of up and coming talented creatives such as Banele Khoza, Neo Serati, Zara Julius, The Payground SA and Kgomotso Neto among others who interpret their stories and express their creativity through photography, fashion, illustration as well as furniture and interior design. The purpose of this event is to uplift and motivate young and up and coming creatives and help them realise that making a creative career sustainable is possible. We also aim towards helping them to improve the quality, professionalism, and knowledge represented in the broader South African creative community. For more information on the talk you can visit Unlabelled’s event page as well as Unlabelled Magazine’s website as we will continually share articles about the speakers, mentors and creatives who will be who will all be collaborating towards the “Know your worth” event. Trap Artist Spender’s New Single “II For The Nights” Now Available On Soundcloud! Wishbone Café and Bistro Marries Food, Art and Design with Finesse!